The liturgical choir Cantores in Ecclesia, established in 1983, began a long and happy residence at St. Patrick's Church in June, 1985, through an arrangement with its pastor, Fr. Frank Knusel, and Bishop Paul Waldschmidt of the Archdiocese of Portland. The choir's first sung Mass at the historic NW Portland Church was the Solemnity of Corpus Christi, for which it sang William Byrd's Mass for Five Voices and selections from his Gradualia (1605). For the next 17 years, Cantores in Ecclesia was synonymous with St. Patrick's, and the beautiful plainsong, polyphonic Masses and sacred motets heard each week at its Solemn Latin Vigil Mass. In September of 2002, the choir established itself as Cantores in Ecclesia, Ltd., a 501 (C)(3) nonprofit corporation. Although it left St. Patrick's later that year, its mission remained constant: to restore the rich treasury of chant and sacred polyphony to Catholic liturgy. For several years it provided music for the Latin liturgy at Immaculate Heart Church, and on the first Sunday of Advent, 2007, it entered into a new relationship with the parish of St. Stephen’s Church at the kind invitation of its pastor, Fr. Petrus Binh Hoang. Cantores in Ecclesia’s “season” is year-long, incorporating two ensembles that sing independently and together each week throughout the year. The children's choir, rehearsing Monday evenings, and the adult choir, rehearsing each Thursday, represent an extensive and energetic commitment of time and talent. With a choral repertoire from early music through the 20th century, the choir is dedicated to offering the very best in Catholic liturgical music. Its deepest roots, however, remain unaccompanied Gregorian chant and Renaissance polyphony. 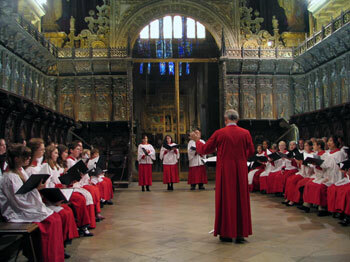 Cantores in Ecclesia has toured widely, at home and abroad, including Mexico, Spain, France, England and Italy. In addition to singing liturgically, the choir also schedules several sacred concerts each year and has recorded compact discs. Throughout its nearly 25 years, it has often been featured in the press, including articles in BBC Music Magazine (August 1997) and Brainstorm (February 2004), and has won gold medals in international competition. One of the highlights of the choir’s commitment to musical excellence is the International William Byrd Festival each August, which for over a decade has brought guest conductors, lecturers and musicians to Portland for two full weeks of the Masses, organ music, madrigals and motets of Renaissance composer, William Byrd. But the principal service of Cantores in Ecclesia has been and will remain the task of combining music and liturgy. At its heart will always be the ancient sung prayer of Gregorian chant, surrounded and supported by the sacred music of great masters such as Palestrina, Victoria, and Byrd. In this respect, Cantores in Ecclesia has changed very little since its inception: a choir fully dedicated to the preservation and promotion of Gregorian chant and sacred polyphony in liturgical context within the Latin Mass of the Catholic Church.